Just what exactly is German Shepherd Temperament anyway? 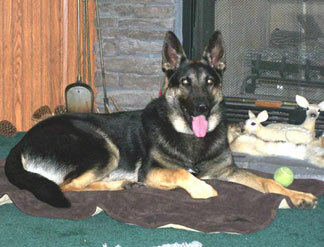 What kind of temperament should a German Shepherd have? First of all, what exactly is temperament? Well, according to wikipedia.org, temperament is defined this way: "In psychology, temperament refers to those aspects of an individual's personality, such as introversion or extroversion, that are often regarded as innate rather than learnt." So, does that clear things up for you? If not, you wouldn't be the only one, believe me, the temperament of german shepherd can be a confusing term or concept to understand, so let's discuss that concept "temperament" just a little bit more. Temperament is one of those words often thrown around when talking about dogs that a lot of people really don't understand in the first place. So, with that in mind, I'll try and explain it to you now so that we will all be on the same page. As far as I am concerned a dogs temperament is made up of many things all based on several factors such as genetics (what the dog is innately born with), the dogs environment and and experiences that the dog has had. So, let's define temperament right now as the dogs general "attitude" toward people and other "critters" and how it displays it's attitude toward other people or animals in whatever situation it may be in. I hope this explanation helps you better understand the term. So, let's take a moment to talk about the specific temperament of the German Shepherd Dog. As we discussed before, German shepherd dog temperament itself is considered to be cumulative in itself - based on many things such as genetics, environment, socialization, education/training and so much more all rolled into one and as such your dog might be described as confident, submissive, hard, soft or even dominant (to name just a few). "The German Shepherd breed has a distinct personality marked by direct and fearless, but not hostile, expression, self-confidence and a certain aloofness that does not lend itself to immediate and indiscriminate friendships. According to the GSD Standard, the dog must be approachable, quietly standing its ground and showing confidence and willingness to meet overtures without itself making them. The German Shepherd is poised, but when the occasion demands, eager and alert; both fit and willing to serve in its capacity as companion, watchdog, blind leader, herding dog, or guardian, whichever the circumstances may demand. The GSD must not be timid, shrinking behind its master or handler; it should not be nervous, looking about or upward with anxious expression or showing nervous reactions, such as tucking of tail, to strange sounds or sights. Lack of confidence under any surroundings is not typical of good character. Any of the above deficiencies in character which indicate shyness must be penalized as very serious faults per the GSD Standard- and any German Shepherd exhibiting pronounced indications of these must be excused from the ring. The ideal dog is a working animal with an incorruptible character combined with body and gait suitable for the arduous work that constitutes the dog's primary purpose." So, what does that all mean for regular people? Basically, it boils down to this - it means that the ideal German Shepherd temperament should be that of a confident dog, not timid or nervous, not hostile, and not overly friendly to strangers on first meet. It should also be able and willing to work. Your own German Shepherd may not live up to all of these standards right now, but concerning the question of German Shepherd temperament, any short comings can always be worked on with proper dog training because while there are many great dogs that are just born that way, there are many more that are not who can become well socialized members of society with great temperaments of their own with just the right training from a caring owner.